We would like to reassure our future guests that in January this year (2019) we engaged a new property maintenance and gardening team to conduct regular routine gardening and maintenance at property. This has been working really well and all recent maintenance issues have been addressed and resolved. We have recently put in two new Queen mattresses and the master bedroom now has brand new furniture including a new bed. The property now undergoes a very vigorous ongoing routine maintenance & cleaning programme to maximise guest satisfaction. The perfect holiday house to getaway and relax all year round. Multiple living areas with the main area open plan kitchen, dining & lounge, 3 bedrooms & 2 bathrooms. 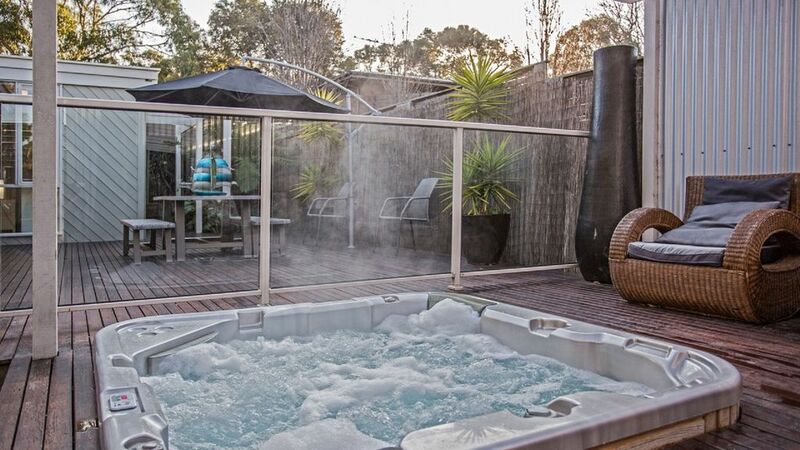 Features include landscaped gardens, outdoor entertaining area with BBQ and outdoor spa. Just a short stroll to Cowes front swimming beach and the town centre. Fully fenced, very safe and secure for young children. Fenced into 3 different sections. Large open plan kitchen, dining, lounge with gas log fire, split system air conditioning, leads out into Alfresco area (with outdoor furniture). Bedroom 2: 1 Queen sized bed. Bedroom 3: 2 Sets of single bunk beds (4 single beds in total). Also available at the property is a single trundle bed. Second living area (flat screen TV, Play Station 2, DVD collection, books & board games). Also available: 1 trundle single bed. Games room with pool table, table tennis, plasma, Dart board and couches. Master Bedroom: 1 Queen sized bed. 2nd Bedroom: 1 Queen sized bed. 3rd Bedroom: 2 Sets of single bunk beds (4 single beds in total). Also available 1 trundle bed if necessary. Top & bottom bed sheets, pillowcases, towels (bathroom or beach towels) & bathmats. Linen for porta-cots is not supplied. Doonas & pillows are provided & beds have mattress protectors fitted. Full linen packs are available on request and will be supplied by Phillip Island Linen Company. (extra charge). Reverse cycle split system for your comfort. High chair, porta cot are available for your use at no extra cost. Please - NO SMOKING INSIDE. PETS: Pets are allowed but must have been mentioned during the booking correspondence. Specific information regarding the pet ie type/breed must be given. Please be aware that pets are to be left strictly outside only, if the cleaner finds evidence that pets have been inside (hair), there will be an extra cleaning charge. (please ignore this if you have not organised to bring your dog). * Please make sure to pick up your dog's droppings. This is your responsibility to do this. Please use a plastic bag and dispose of the bag in the outside rubbish bin. * If your dog is a compulsive barker or tends to bark more in unfamiliar environments you may want to consider ?leaving him/her at home. Dogs that bark relentlessly have been an issue with the neighbours in the past at this particular property. To ensure you have "quiet enjoyment" of the property the owners and management would prefer the peace be kept. DOGS ARE NOT PERMITTED INSIDE THE HOUSE. Weekend and Long weekend Stays may be allocated a late checkout which will be subject to change. If another booking booking comes into the property on the day of your checkout the checkout time will be reverted to the standard checkout time of 10am. HomeAway/Stayz online bookings will charge a SERVICE FEE. This fee is not paid to us as the owners and is a charge made independently by the HomeAway/Stayz online payment booking system. Local Attractions: Penguin Parade, Koala Conservation Centre, A maze n things, Minigolf, Seal Rocks, Local Wineries, Grumpy's Crazy Golf and Waterslide, RSL, Australian Motorbike Grand Prix Circuit, Superbikes and V8 Super Cars, Funshed (playcentre) and Tenpin Bowling, Churchhill Island, Chocolate Factory, French Island, Surfing, Golf Clubs, Fishing, Walking and cycling paths around Cowes. Have stayed here before, great house and great location. Good location. Short walk to beach and 15 minuite stroll to town. Overall first impression was not up to the expectations set by the photos. Dead plants in the plant pots and vegetation growing through the decking was a sign that this house was purely a rental. Inside the lounge kitchen was quite large but second main bedroom was quite small with access to the bed only from one side, the other was against the wall, yet the main bedroom took over half the house. The beds were very low to the ground and were rock hard. Doors either didn't close or stuck making it very hard to get out without waking the whole house. One of the bathroom doors had a locking bolt that was a screw and the other one was hard to slide across and harder to unlock. At nights the house is very loud as it settles. Sounding like someone walking around. The spa was clean was a nice place to relax. Our group have been renting holiday houses each year for the past 25 years, for the money we paid for this one, we all agreed that it wasn't the worse we had stayed at but, it wasn't one of the better ones either, unfortunately. Thank you for your review Andrew, we appreciate all feedback both positive and negative and we strive to address any issues immediately. We would like to reassure our future guests that in January this year (2019) we engaged a new property maintenance and gardening team to conduct regular routine gardening and maintenance at property. This has been working really well and we have now addressed all of the issues mentioned in your review. In regards to the feedback about the second bedroom, this bedroom and bed is clearly depicted in the photograph on the website. This bedroom now has a brand new mattress. We have also replaced all the furniture in the master bedroom including a new bed and new mattress. We have also addressed a lot of maintenance issues in the house including fixing all the internal doors, latches and locks. There is also a brand new front door. The property now undergoes a very vigorous ongoing routine maintenance & cleaning programme to eliminate any issues moving forward. We are here to help and make your stay as comfortable as possible. Great stay. Great house plenty of space. Complete Office and Workstation I. Our stay was great it was a perfect house excatly what we need. Short stroll to the beach. Will stay there again. Mauro was great to deal it in booking this house he made it very easy. Hope to book with you again. We loved the place ! The spa was a hit ! And the games in the garage kept us entertained . The only bad thing is I think you could do with another fridge. But would definitely stay there again. Plenty of room for all of us with space for the kids to have fun. The Basketball game was a big hit. Excellent property!! Looks exactly like the photos! Great floor plan with lots of space and very comfortable. Garage space was excellent and well used by the kids! House was well equipped with everything you could need! Spa was great too! Would definitely recommend, and will definitely book this property again!